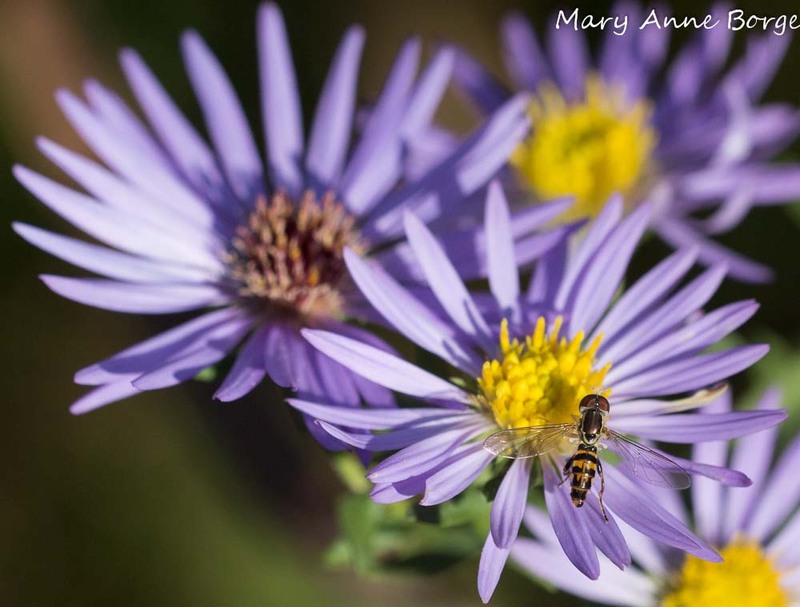 Asters Yield A Treasure Trove! A few days ago the weather was beautiful, with temperatures in the mid-60s, cloudless blue skies and a bit of a breeze, so we went for a walk at a wildlife management area in West Amwell, New Jersey. We were looking for birds, fall fruit and foliage, and any other interesting critters that happened to present themselves. 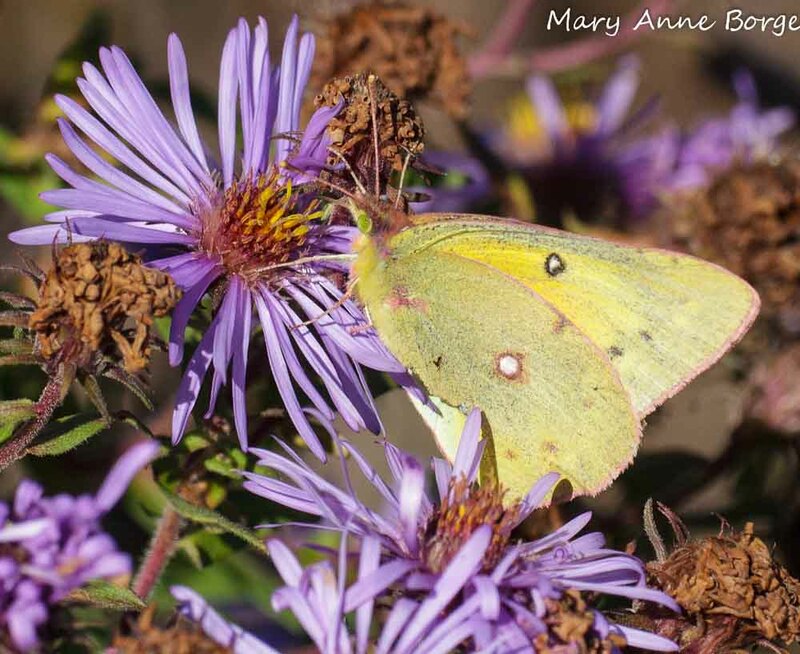 We didn’t expect to see a lot in the way of butterflies because of the cool temperatures, and because it’s so late in the season. We didn’t see many butterflies, but those we did see were pretty spectacular. Orange Sulphurs were out and about, which was to be expected, since they are among the species that stay active as late as November in this area. 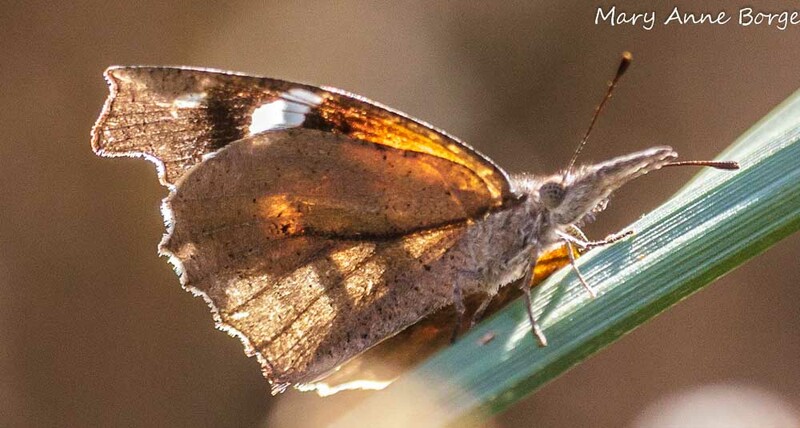 But the surprises were a Fiery Skipper and an American Snout, both of which are fairly rare in New Jersey, especially in late October. 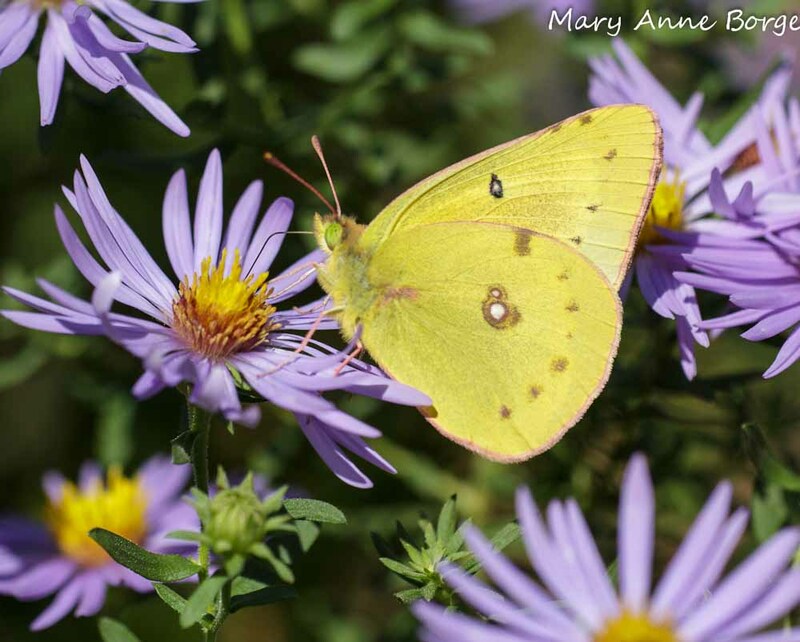 All were nectaring on various species of asters, or other aster family members, the goldenrods. 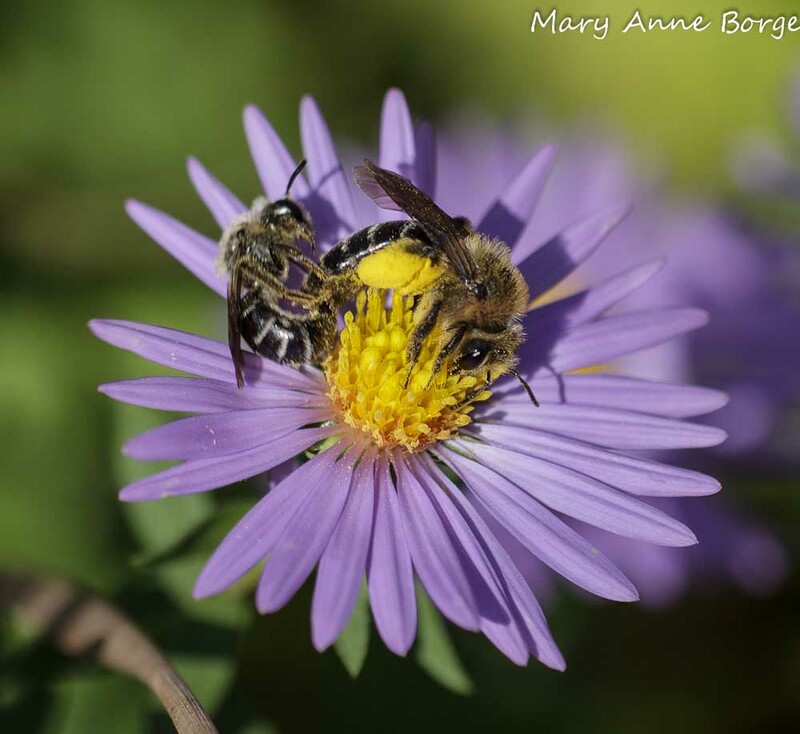 Asters family members are the primary source of food for late season pollinators. They are prolific in their long bloom period, often continuing into November. Their flowering structure reflects a very clever strategy, and suggests this plant family’s alternate name, ‘composite’. What looks to us like a single flower is actually a cluster of tiny flowers, potentially of two different types, ray flowers and disk flowers. 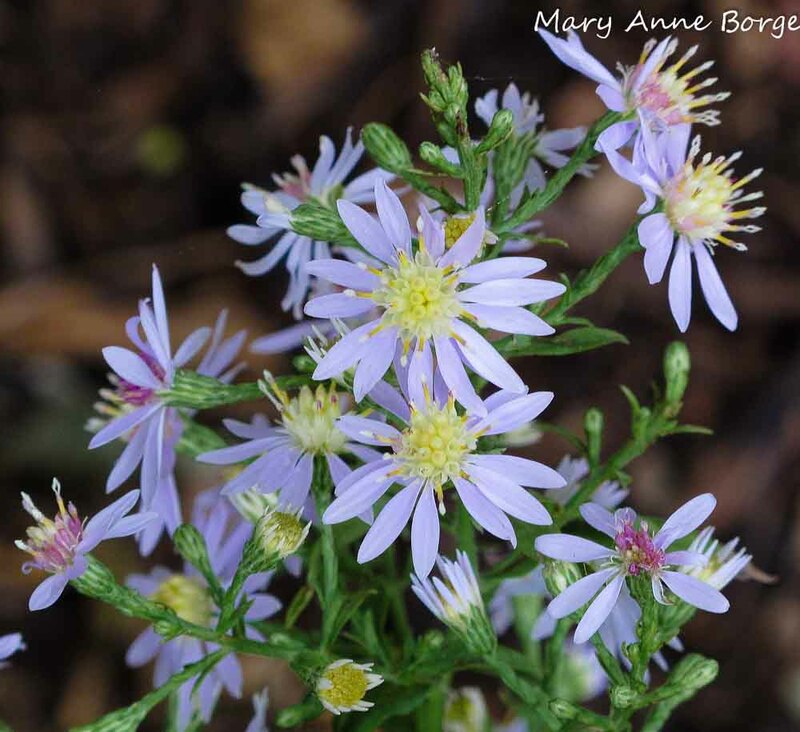 The photograph above of Blue Wood Aster (Symphyotrichum cordifolium) shows the classic flower heads of the Aster family: a circle of ray flowers that look like petals, pale blue in this species, surrounding a cluster of tiny tubular disk flowers in the center of the head. If you look carefully at the disk flowers in this photo, you can see that the outer rows are open and blooming, while those in the center of the cluster are still in bud. This gradual bloom habit supports a long period of flowering, offering nectar to fall pollinators for many weeks. The disk flowers of this plant are a pale yellow in bud and when they first open, then turning pink or magenta as they age. 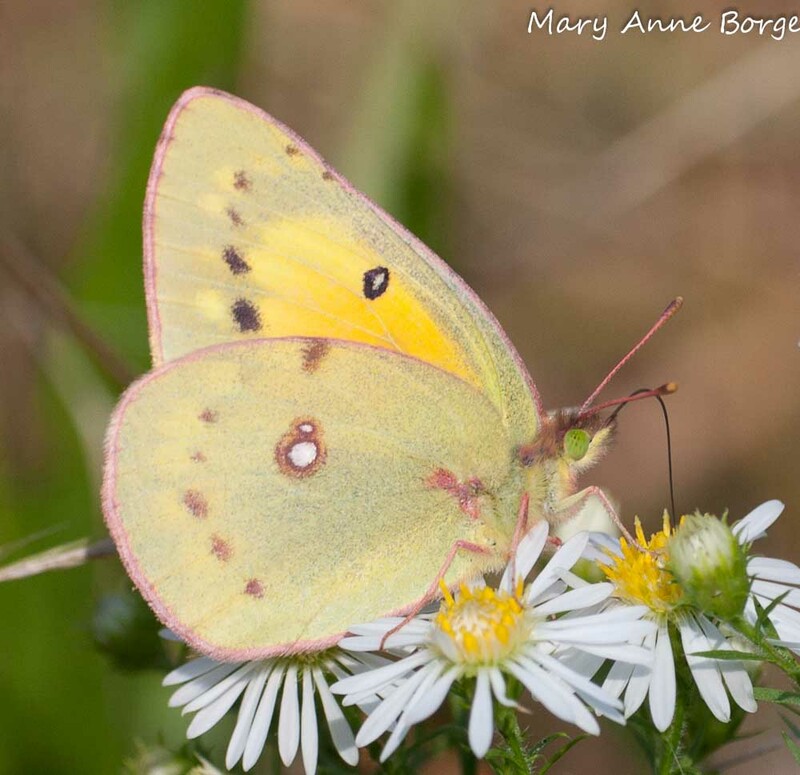 This color change is thought to be a signal to pollinators, directing them to the receptive yellow flowers which are not yet pollinated and that will reward them with nectar, and steering them away from those blossoms that are already satisfactorily pollinated. (Plants are so clever!) Notice the pink and magenta disk flowers in some of the flower heads in this photo. 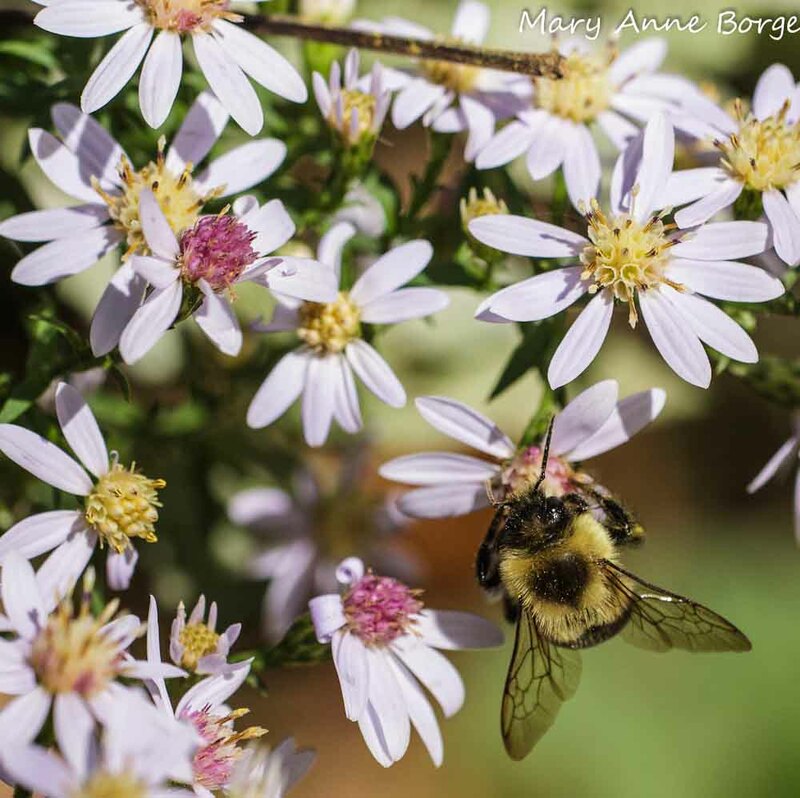 As soon as the temperature gets into the low 50s on these crisp late October mornings, the Bumble Bees begin foraging on billowing clouds of luminous Blue Wood Asters outside my windows, soon joined by other tiny bees and flies. Large dense clusters of bright pale blue flowers top the heart-leaved covered stalks of this woodland beauty. 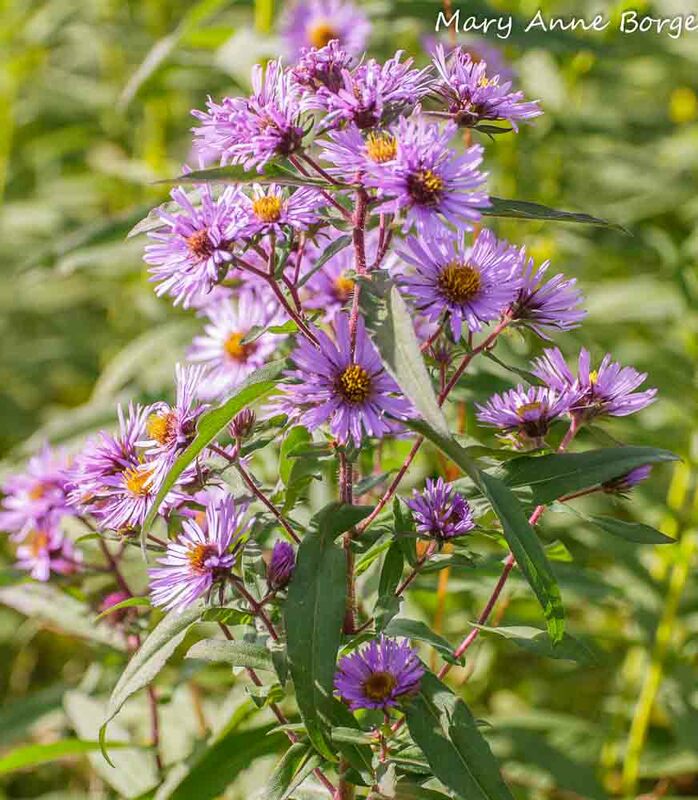 The shape of the leaves is reflected in the species name, cordifolium, and also gives this plant another commonly used name, Heart-leaved Aster. Pair Blue Wood Aster with White Wood Aster (Eurybia divaricata) and Wreath (Bluestem) Goldenrod (Solidago caesia) or Zigzag Goldenrod (Solidago flexicaulis) for a spectacular late season shade garden display. 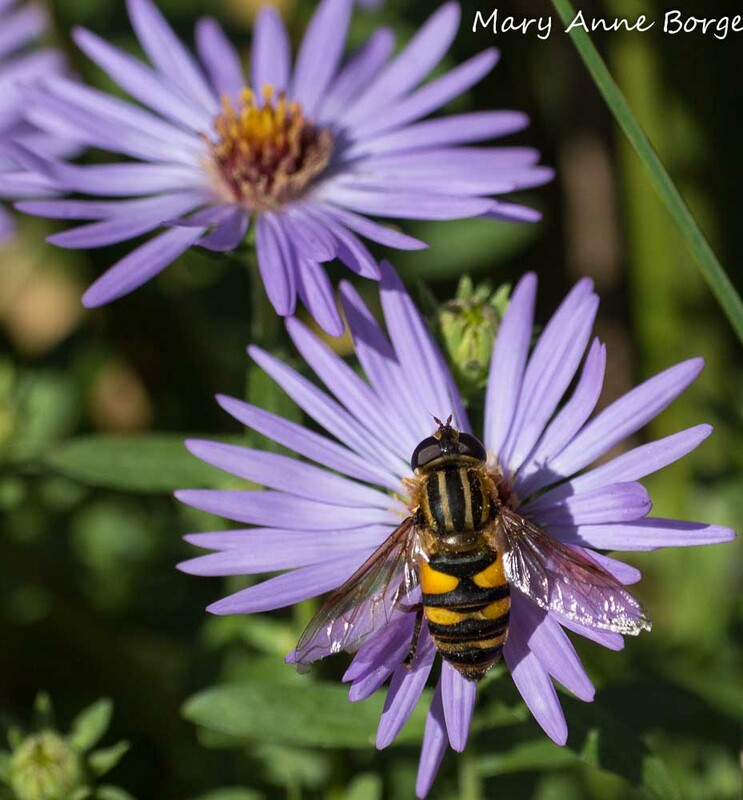 Favorites for a sunny garden or meadow include New England Aster (Symphyotrichum novae-angliae), which is also seen blooming in many spots along roadsides, and Aromatic Aster (Symphyotrichum oblongifolium), whose intense blue flowers are irresistible to insects and humans alike. Following are more asters and their visitors. You never know what treasures asters will yield! 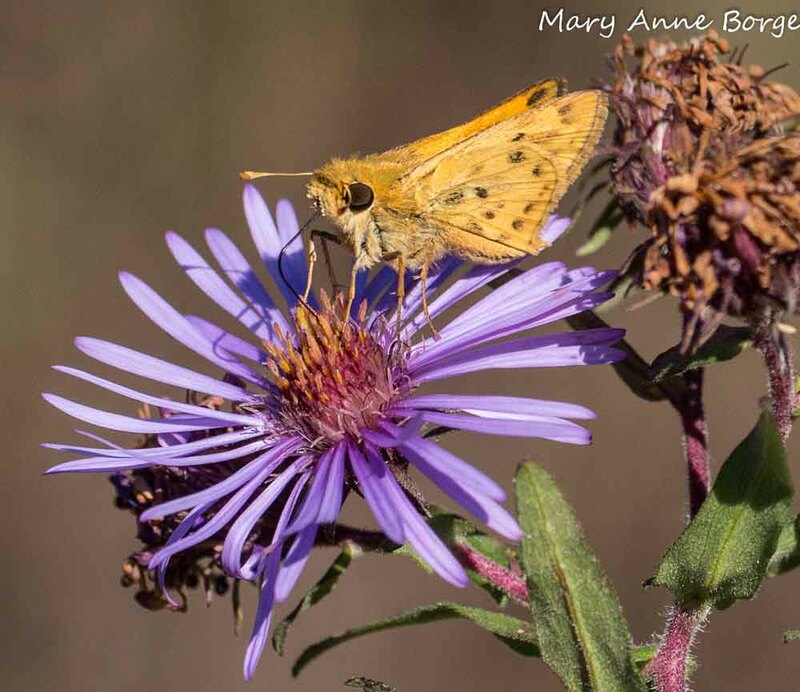 This entry was posted in Butterflies, Gardening for Wildlife, Native Plants, Other Insects and Spiders and tagged American Snout, Aromatic Aster, Aster, Blue Wood Aster, Common Buckeye, Common Checkered Skipper, Fiery Skipper, Flower Fly, Hover Fly, nature, New England Aster, Orange Sulphur by Mary Anne Borge. Bookmark the permalink. 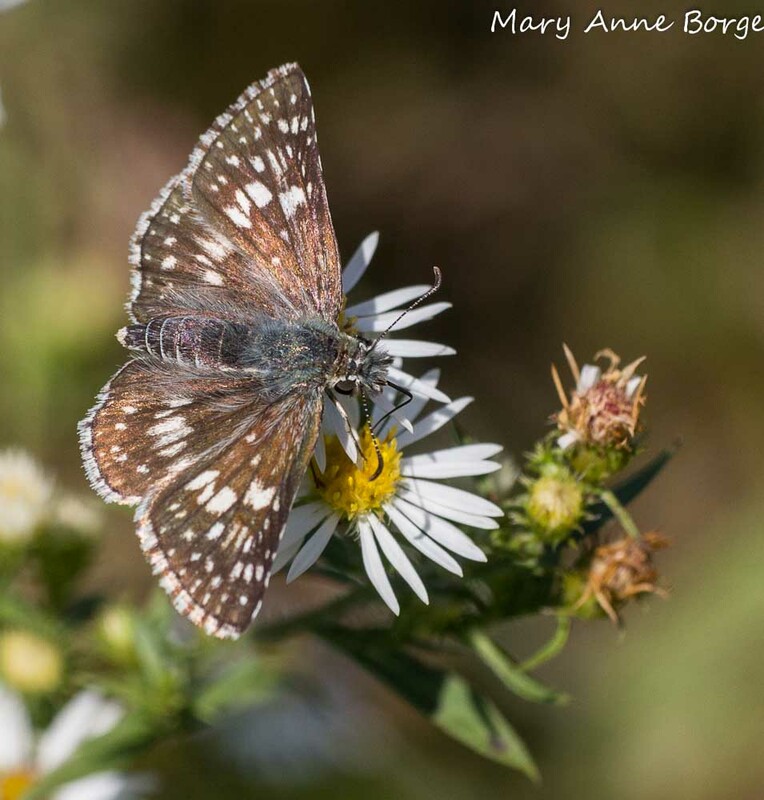 What a wonderful partnership between the late blooming asters, in flower after the frost has polished off most other blooms, and the late butterflies you show us here! The aster family is so important! 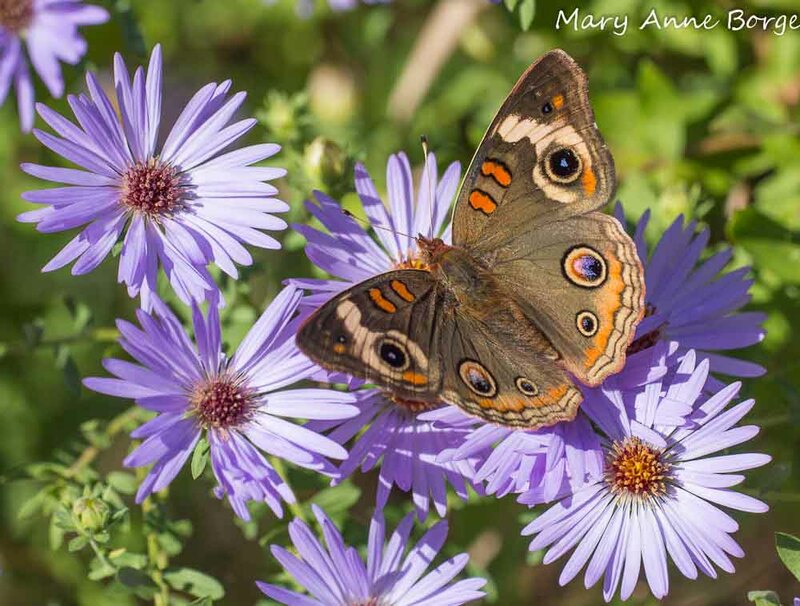 Coming soon: a post featuring several different flower visitors on New England Aster. Stay tuned! Beautiful and educational as always…I’m so happy that you listed the shade group since I mostly have shade in my yard. I’ll be picking some of those up. Thanks! We have pretty much all shade, too. There is one spot that gets a few hours of afternoon sun. But amazingly, we always have something blooming from April through November! I’ll highlight some more shade plants in future posts – both plants that make shade and plants that like shade. Thank you! I love macro photography. When I review my photos on a computer screen I often see things I didn’t even know were there.